Over the weekend, I prepped and froze five slow cooker meals in less than an hour (including clean-up!). Here’s my grocery list, recipes, and best freezer meal tips! Before my third baby was born, I was a freezing machine. 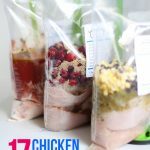 In a previous blog post, I shared how I stocked our freezer with 27 homemade meals (mostly because of a big freezer meal day with my mom). We loved having those freezer meals on-hand, but now that I’m balancing life with three little ones my freezer is empty again. Most days I’m more worried about getting dinner on the table than stocking my freezer with meals. Over the weekend I put on my big girl pants and devoted an hour to prepping some freezer meals that can be frozen raw. I was able to assemble five slow cooker freezer meals in an hour – including clean-up! Label all bags with what’s inside and the “use-by” date. Peel and chop all veggies and add to bags. Add sauces, spices, and everything else to bags in any order, except the meat. Cut all chicken into bite-sized pieces. Add meat to all the bags (You want it to be on the top so it’s poured into your slow cooker first). Remove as much air as possible and freeze! 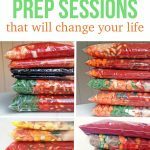 Since all of these meals were frozen raw, they were super quick to prep and won’t taste like leftovers at all. Yay! 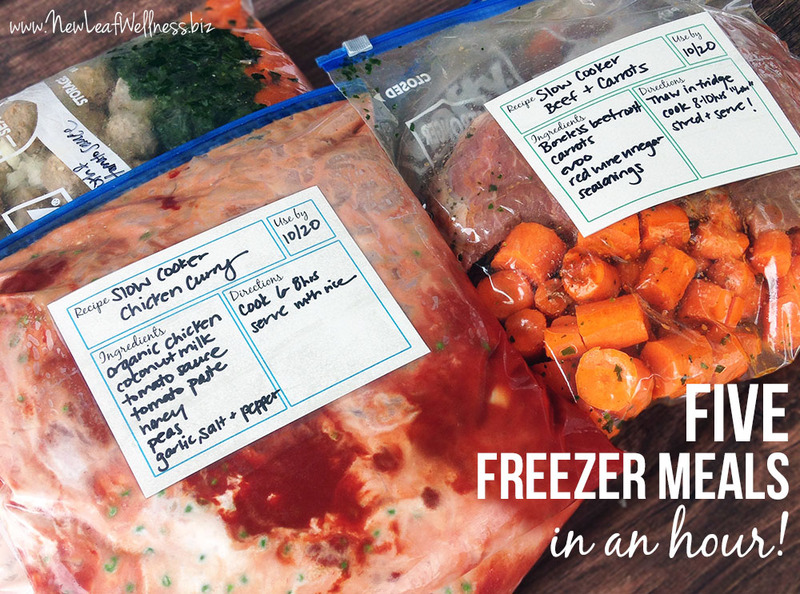 Have you ever tried freezing meals for your slow cooker? Please share in a comment below! Where did you get your labels? I love them! Thank you so much!! I designed them to include in my No Cook Freezer Meals cookbook. A lot of people have asked me about them so I also sell them as a separate download for .99 cents. Is the curry spicy? We can’t do spicy. The hottest we can do is mild salsa lol. Also we can’t use products that contain alcohol. What can I use instead of the red wine vinegar? It’s a little bit spicy, but nothing too crazy. You could decrease the amount of red pepper flakes or omit them altogether if you want. How do you determine the “use by” date? For standard freezers attached to refrigerators, I write three months from when the meal was made. If we are using a deep freezer, what do you recommend? I believe they will last for 6-12 months, but I’ve never tried. Hi, I can’t help but noticed that you are storing your freezer meals in plastic ziploc bags. Hope these plastic bags don’t contain BPA and other harmful chemicals that leech out over time over your freezed meals that you and family members plan to eat. Maybe years or decades from now, these chemical over-exposure will show up as cancer and other health problems. Thank you so much for taking the time to comment! 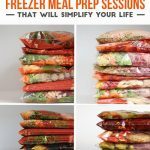 I use name-brand freezer bags, like Ziploc and Hefty, and they are BPA-free. I also LOVE neat-os reusable food storage bags, but they only work for freezer meals without sauce. 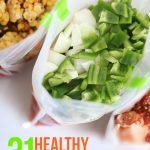 You can see my review of them here: https://thefamilyfreezer.com/2014/03/20/review-neat-os-reusable-food-storage-bags/ They’re really great! You will love it! Such a time saver!! Just a heads up….it is not necessary to thaw before you put in crockpot. You do however have to give it extra cooking time. Being able to eliminate that step has been a life saver for me at times! Thank you for sharing! How do you fit the meal in your crockpot? Do you freeze it in an oval shape?